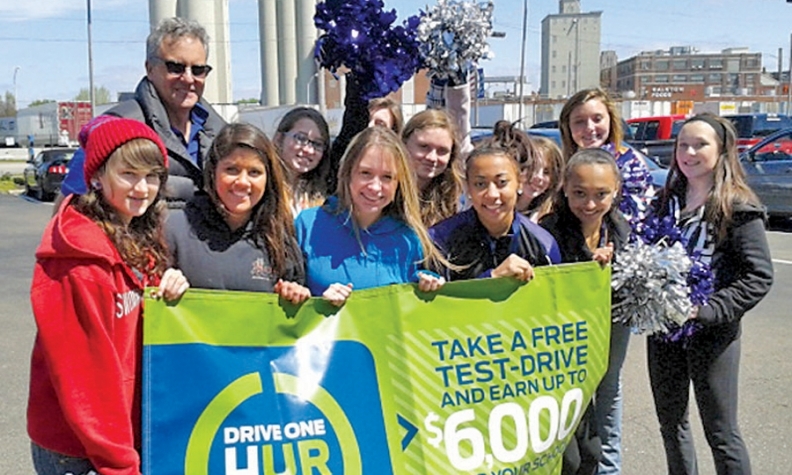 Since Vince Pavone bought his Ford-Lincoln store in Battle Creek, Mich., in 2010, he has become deeply involved in community fundraisers, such as the local Ford "Drive One 4 UR School," shown, and an annual kickball tournament. Kickball, child seats and Christmas trees have helped Vince Pavone turn around a failing Ford dealership in Battle Creek, Mich. When Pavone bought the store in 2010, it was headed toward insolvency after going through a string of owners and name changes. Pavone changed its name once more, slashed overhead, cut deals with creditors and created a new management structure. The result: Lakeview Ford-Lincoln turned a profit in its first month, Pavone says. But to succeed long term, Pavone believed the key was building a stronger relationship with the community. He uprooted his family from the opposite side of Michigan, convinced that the previous owners failed largely because they ran the dealership from afar. "We realized that was the missing component," says Pavone, 53. "None of the management of the dealership had lived in Battle Creek for the last 15 or 20 years. They had been absentee owners who were trying to do it long distance. It needed to have community relationships and contribute to the community." To that end, Pavone not only has sponsored but also become deeply involved personally with numerous charitable events in town, including an annual kickball tournament with several Detroit Lions stars that raised almost $30,000 last month and periodic clinics that provide child restraints to dozens of needy families. The activities have positively affected his business as well as the Battle Creek area. Lakeview sells about 40 new and 40 used vehicles per month, roughly double from before Pavone took over. Total sales through May are up 30 percent this year, to 407 units, and new-vehicle sales are up 38 percent, compared with a 7 percent increase for Ford Motor Co. nationwide. "It's definitely been very fulfilling, and it's helped make a name for us in the community," Pavone says. "I feel like it's been a successful formula for us, though it wasn't necessarily a formula for sales but for inclusivity in the community." For the child-seat clinics, Pavone clears out his service bays and pays to bring in technicians who ensure the restraints are installed correctly. He has also bought billboards and full-page newspaper ads to promote them. "Vince is always looking for a way to serve his community," says Mary Barkley, a project coordinator with Calhoun County's Early Childhood Connections program. "He approached us and said, 'How do we work together to make this happen?'" During the first clinic last year, Barkley found her husband looking at pickups on the lot. He went back a few days later and bought an F-150. "Most of the people who come to these events have never stepped foot on our property," Pavone says. "It's really about raising awareness about our store and having the community trust that we're giving back and we're a good citizen. Then they can trust that you're going to give them a good deal on a car because you're not going anywhere." The kickball tournament, which benefits an organization that helps youngsters with disabilities participate in recreational activities, began last year in conjunction with former Detroit Lions quarterback Drew Stanton, who had done some promotional work for Lakeview. This year the event doubled in size after Pavone and Stanton recruited Lions quarterback Matthew Stafford and receivers Calvin Johnson and Nate Burleson. Pavone also has put together fundraisers for local high schools through Ford's "Drive One 4 UR School" program and an annual Christmas tree sale, for which he donates space on his eight-acre property and all of the trees that are sold. Pavone says he learned the importance of community engagement from his father-in-law, Bill Fox, who owns Bill Fox Chevrolet in suburban Detroit. After a 17-year career in sales with a metal-processing company, Pavone worked for Fox for four years before deciding to buy his own store. Pavone "definitely sticks out as the car dealer who is really offering his time in the community," says Ed Burnham, the board chairman of Battle Creek's Binder Park Zoo, for which Pavone is organizing a fundraising gala this fall. "It really surprised me to see how fast he really dug into the community and became a part of the community."